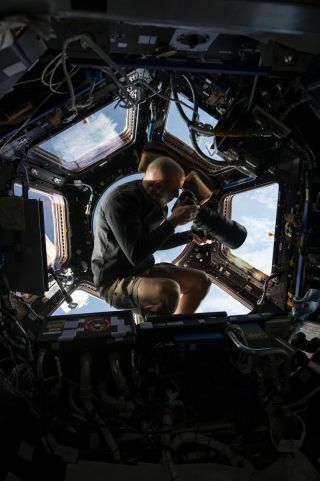 In this image, NASA astronaut Chris Cassidy uses a digital still camera to photograph Earth from the cupola on the International Space Station. Cassidy told SPACE.com that the cupola is like the astronauts' campfire, where they congregate to share stories and converse. After more than five months aboard the International Space Station, NASA astronaut Chris Cassidy is getting used to life with gravity again. "I feel really good," Cassidy said Thursday (Sept. 19). "The exercise program that we have up there does a fantastic job because I was able to walk pretty much hours after getting out of the Soyuz and I started driving again today. I feel like I've got my balance." "A year is a long time," Cassidy said. "I talked to Scott just the other day about it. And I thought to myself, too, as I was leaving the space station last week, what would it be like if I was only halfway done right now? How would I feel?" Cassidy thinks that psychologically, the long mission would be just fine. "Mentally, you prepare yourself for what you think the duration is going to be, and he knows it's going to be a year going into it, so he'll be fine from that respect," said Cassidy, a 43-year-old former U.S. Navy SEAL. But fatigue can settle in for the crew sustaining the $100-billion International Space Station, where there are hundreds of science experiments and maintenance tasks to complete. There are constant worries about the schedule and what to do if an alarm sounds, Cassidy said, and though the astronauts do get weekends, they spend a good chunk of their Saturdays cleaning. "My personal opinion is that you'd want to have in second half of the year ... a three or four day weekend every month," Cassidy said of Kelly's year-long trip. "I think that would go a long ways to keeping him fresh." Life aboard the the biggest manmade structure in space can indeed be stressful. Cassidy took part in an unplanned spacewalk to hunt for an ammonia leak in the space station's cooling system in May. Then in July, his last spacewalk had to be aborted after Italian astronaut Luca Parmitano's helmet began filling with water. "I saw the water growing bigger and bigger inside his helmet," Cassidy recalled. "Luca and I both knew that it wasn't normal and it was time to go back to the airlock right about the time the ground came to same conclusion." Chris Cassidy works on the International Space Station. A little more than one hour into the spacewalk, Luca Parmitano (out of frame) reported water floating behind his head inside his helmet. This image was released July 16, 2013. Cassidy told SPACE.com that the crew on board the space station took apart Parmitano's suit a few weeks ago and has narrowed the problem down to one or two components that will need to be tested on Earth. "The suit will probably come back on the next SpaceX vehicle that returns I think early next year," Cassidy said. "And then we'll really, no kidding, know what the problem is." A SPACE.com reader wanted to know if readjusting to life on Earth is difficult for an astronaut socially, but Cassidy said being on board the space station was itself very social — "kind of like if you've ever been camping." Though instead of gathering around a campfire, astronauts flock to the windows of the space station's cupola to talk and swap stories. "When you have people sitting around the window looking at our planet and just marveling at its beauty … people tend to be less guarded," Cassidy said. "That's what I felt with my crewmates. We had some really fun and open conversations just sitting around the window." From their privileged perch at an average of 240 miles (386 kilometers) above the planet, the space station crew is treated to spectacular views. Cassidy said one of his favorite places to spot on Earth was the Nile River and its delta in Egypt, which, during the day, looks like a winding stretch of green set starkly against a vast desert. Then at night, the bright lights of development outline shape of the world's longest river. "That's one of the most pretty places in the day and at night," Cassidy said. "You absolutely can, and it's very common to come back weighing less," Cassidy said. But losing weight in space isn't usually a good thing; it can be a sign that the body is losing its bone and muscle density. The space station crewmembers typically exercise two hours each day on special gym equipment to combat those effects. "I like dessert a little too much apparently," Cassidy said. "I was one of the few people who came back with more body fat."